The decision to rebrand Athlete’s Foot’s is just the tip of the iceberg in a comprehensive plan that sees the retailer tapping deeper customer insight and technology to build better engagement with consumers, its marketing chief says. This week, the retailer launched a major rebrand of its core brand, loyalty program, in-store and digital offerings and embarked on its first brand advertising campaign in more than five years. Athlete’s Foot head of marketing, Caroline Squire, told CMO a couple of reasons prompted the brand shake-up. The first trigger was giving the store look-and-feel needed a facelift, while the second was addressing the more rapid changes occurring around consumers and their exercise habits. The retailer partnered with market research firm, RetailOasis, to develop its overarching strategy and commercial opportunity, and to identify changing consumer needs that Athlete’s Foot could not only tap into, but take ownership of in the market. The second step was working with M&C Saatchi division, RE, to turn it into a more comprehensive brand proposition. “The first part of that was about understanding our target customer segments at a much deeper level,” Squire explained. To do this, Athlete’s Foot worked with Monash University’s ACRS on a research study to understand consumers in terms of how they exercise, what their performance journey is mentally and physically, and what they’re looking for from a footwear retail partner, and how to engage at a deeper level, she said. Athlete’s Foot then worked with retail design consultancy, ARCD, to develop a new-look retail store. So far, 12 of Athlete’s Foot’s 135 national stores have been rebranded. 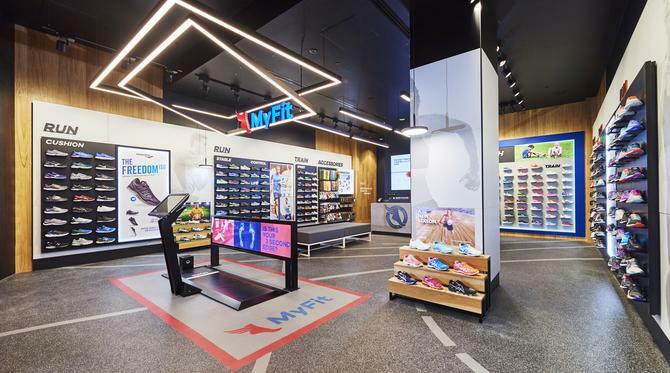 The group has also rebranded its shoe fitting technology to MyFit, and refreshed the look and feel of its customer loyalty program under the new ‘MyFit Rewards’ moniker. Importantly, there’s also extensive work going on behind the scenes to utilise data to drive more engagement. Athlete’s Foot is building what Squire called a customer-centric ‘MyFit’ ecosystem, grounded in insights and a personalised, lifecycle approach to engagement. This will be supported by the launch of exclusive new wearable technology in coming weeks that will give the retailer unparalleled insight into how consumers use its products and allow it to deliver more personalised messaging and interactions, she said. Athlete’s Foot has already been working to improve its communications strategy based around the customer lifecycle. In 2012, the loyalty program underwent an overhaul to bring it into the digital age, supported by a unified view of customers and lifecycle-based approach to email communications based on 135 different criteria including purchase data, what they browsed on the website, age and demographic and interactions with communications. With the new end-user technology, Athlete’s Foot will better understand how consumers are using their shoes, running and exercising, and how the business can be the support to enhance that performance journey, Squire said. On top of this, Athlete’s Foot has invested in retraining all staff members around its fitting technology, and is working on a training program that will help bring in-store staff up to speed around its target running customer base. “One of the insights from our research is that employees are viewed as retail assistants, but they are in fact shoe technology experts. They have to be more educated around running to have a better peer-to-peer conversation with the consumer,” Squire said. Athlete’s Foot’s new branding launched on 22 August and is being supported by mass market advertising across Channel 9 and Foxtel. Digitally, the retailer has invested in YouTube as well as its owned Facebook and Instagram social channels, blog and website.